The goal for all of us. It is no secret that most Americans do not get enough sleep. We know that sleep is vital to our health, mood, and general ability to function, yet when life gets stressful, sleep is often the first thing to go. Sometimes this is for reasons beyond our control. Most people who have had a baby have had to cope with going through life in a sleep-deprived haze at least for a while. There are times when hormones make sleep a near impossibility, or when the huge amount of things weighing on one’s mind forces one to toss and turn despite one’s best efforts. There are many times, however, when there is no reason for us not getting enough sleep other than we simply choose not to. We make other things more of a priority. I have heard very busy women say, “I’ll sleep when I’m dead.” I can sympathize. There does always seem to be more to get done in a given day than hours in that day! As Joan C. Webb writes in “It’s a Wonderful (Imperfect) Life” our inner voice tells us “If I go to sleep, I’ll be wasting time. I should make good use of each minute. . . Your value depends on how well you spend each second. Stay busy. Don’t waste any precious moments. Keep an account of every hour.” I’m sure many of you reading this are nodding in agreement. Especially for mothers who spend so much of their time caring for others, it can seem like those late-night or early-morning hours are the only opportunity to get the other tasks done or to get some much-needed time to care for oneself. The irony is that getting enough sleep each night will allow us to take care of both ourselves and those we love better. If we can’t get enough sleep at night, it means that something is out of whack in our lives. We need to reduce how much we have on our plates or we need to get a little bit better at asking for help. Maybe we need to simply reduce our expectations of what it means to be a productive person. Webb offers a new mantra to replace the inner voice that keeps driving us to do more: “I’m valuable even when I’m not busy. I can go to sleep at a sensible hour and still be a productive person.” She refers to a quote by from “The Rest of God” by Mark Buchanon, “We give ourselves, regardless of our unfinished business, into God’s care. We sleep simply because we believe God will look after us.” That is so comforting. Yes, God does look after us even when we are sleeping. God wants us to rest in Him and to trust that whatever we do get accomplished in the hours we are awake is enough and is pleasing to Him. If you are one of the many suffering from a lack of sleep, try going to bed just 15 minutes earlier each night. It is a small step, but it can make a huge difference. Once that becomes comfortable, add another 15 minutes. These simple adjustments can help improve one’s outlook tremendously and help one be more productive with the time one does have during the day. Sometimes simply getting up is enough. In the June 2009 issue of U.S. Catholic several writers share their stories of how faith helped them through their darkest hour. Suzanne M. Pearson of Rochester, NY writes how she felt "the voice of God in the depths of [her] being: 'You get up every day. That is enough.'" I think that quote is important for all of us to remember when we are going through a rough patch. Sometimes all we can do is get up and make it through the day and turn it over to God. That is enough. We acknowledge the great need to pray for vocations to the priesthood. It is not surprising that, where people pray fervently, vocations blossom. O Father, raise up among Christians numerous and holy vocations to the priesthood, who keep the faith alive and guard the gracious memory of your Son Jesus through the preaching of his word and the administration of the Sacraments, with which you continually renew your faithful. Give us holy ministers of your altar, who are careful and fervent guardians of the Eucharist, the sacrament of the supreme gift of Christ for the redemption of the world. Money needed to educate seminarians! The Diocese of Springfield, MA has a good problem - we have doubled our number of seminarians in the past few years! This is great! However, now we need money to help educate them. They are responsible for their undergraduate education but their seminary studies are paid for by the diocese. If you can help in any way, please consider making a donation to help secure the future of the priesthood in our diocese, especially in this "Year of the Priest." You can visit www.myvocation.com or contact Fr. Gary Dailey, Director of Vocations at 413-452-0811. Thank you! Visit CatholicMom.com today at http://new.catholicmom.com/2009/06/22/special-event-today-catholicmomcom-hosts-the-meal-box/ to find out about a great new product designed to increase conversation around the dinner table. You can find out more, ask a question, or leave a comment! Check it out! Duncan’s photos are breathtaking. The colors are intense. One feels as if one could step right into the photos. Duncan takes the reader from Tarsus to Caesarea to Stephen’s gate to Damascus, throughout all of Paul’s travels, and finally ends in Rome. Interspersed with the photos are quotes from the book of Acts as well as insights about St. Paul from well-known Christian writers. Max Luxado writes of St. Paul’s conversion, “Alone in the room with his sins on his conscience and blood on his hands, he asked to be cleansed. The legalist Saul was buried, and the liberator Paul was born. He was never the same afterwards. And neither was the world.” Richard Exley reminds us of the value of offering encouragement: “Sometimes the most significant things we can do for the Kingdom of God is to encourage others. Only God knows how far-reaching our investment in their lives may be. When Barnabas took time to encourage Saul, I doubt that he ever imagined that his kindness would affect believers for twenty centuries to comes, but it did and it does. Never make the mistake of belittling the eternal value of the ministry that you invest in another.” Rick Warren offers the reflection that “Great souls are grown through struggles and storms and seasons of suffering. Be patient with the process.” Henri Nouwen invites us to discover how we can best use our own gifts to be of service to others. 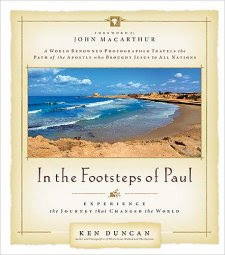 “In the Footsteps of Paul” offers a wonderful introduction into the life and travels of St. Paul. Ken Duncan has put together an inspiring collection of photographs and meaningful reflections. Susan Hines-Brigger wrote a very insightful article for St. Anthony Messenger entitled "An Ever-Changing Love." Hines-Brigger reflects on the famous passage from 1 Corinthians 13:4,7 : Love is patient, love is kind . . . It bears all things, believes all things, hopes all things, endures all things. Like many of us, she had this as one of the readings at her wedding and at the time she reflected on it only in light of married love. However, through the years, she has come to understand how it speaks to all types of love. Yes, there are many types of love in this world, but all of them have the elements that St. Paul refers to. Love is a precious gift. St. Paul has a load of wisdom revealed in these few words. We should all work to live up to them in all of the various loving relationships in our lives. The Gospel readings for today and tomorrow come from the book of Matthew (5: 38 - 48) where Jesus is instructing us to turn the other cheek and love our enemies. This is perhaps one of Jesus' most radical teachings. After all, it is relatively easy to love those who are kind to you - much harder to love, or even be kind to, people who are spewing nothing but venom in your direction. In today's Living Faith Rebecca Sande suggests saying a prayer for the person who is making your life miserable. I have done that in my own life and it does help reduce the anger and enmity that you might feel toward the offending party. I don't remember exactly where I read it, but I recall a saying that "It is impossible to hate someone you are praying for." Prayer is an important first step on the road to loving one's enemies. Last week I had the pleasure of being part of a panel discussion on beginning homeschooling at the 1st Annual New England Catholic Homeschooling Conference. I have just finished my first year of formal homeschooling my two sons who have successfully completed 2nd and 1st grade. I am hardly what one would consider a homeschooling veteran. Thankfully, the conference had several other speakers with many years of homeschooling experience under their belt. Yet, I felt I did have something to offer this particular group of people I found myself standing in front of. Sometimes when one has been doing something for a long time, one forgets the fear one felt at the beginning. I could recognize and relate to the fear in the eyes in front of me. Hopefully, I helped to allay some of their concerns and helped convince them that they could take on the awesome task of educating their children. It has been said that homeschooling is a separate call within the call of motherhood. Certainly, not every one is cut out to homeschool and I am very grateful that there are schools. Nevertheless, some women know even before their children are born that homeschooling is what they were meant to do. For others, the call comes later, perhaps out of necessity. Then there are people like me who hear the call, pray about it, and still run in the opposite direction! I first heard the call when my older son was just shy of two years old. I read a homeschooling magazine and was intrigued by this alternate means of education. I would go on to read everything I could get my hands on about homeschooling. I thought it would be such a good fit for us. Nevertheless, I would go on to send both that child and his younger brother to school because I wanted to be “normal.” School was a disaster for them, yet I was still determined to stay the course. God basically needed to smack me over the head to get me to finally heed the call. I received a letter from my son’s first grade teacher last April telling me that there was no way my very anxiety prone son was going to be able to cope with second grade. I had no choice. I had to take the plunge and I was absolutely terrified. Thankfully, I had some friends who homeschooled who greatly helped with that transition with prayer, support and advice. While certainly not always easy, this past year has been a great gift. We belong to Western Mass Catholic Homeschoolers whom we get together with twice a week. Both my children and I have made great friends. As far as their actual education goes, we completed all the textbooks, something that rarely happens in a traditional educational setting. Perhaps the greatest gift, however, was the gift of time. Our lives were so much more relaxed once school was taken out of the equation. There were no more morning battles. If the children wanted to sleep past 6:15 a.m., this was no longer a big deal. There were no more after school battles regarding homework. No more rushing from school to after school activities. No more struggling to find the time to visit grandparents. No more hearing complaints about how there was no time to play. Homeschooling is very time efficient. Most days, we were done all formal lessons by noon and that was with breaks. Afternoons were spent reading for enjoyment, playing games, and pursuing their individual interests. There was time for frequent play dates with friends. After school activities were no longer a burden. There was plenty of time to spend visiting with other family members, nurturing those relationships. For people considering homeschooling as a possibility for next year, the strongest argument that I could give them to try it is that they will get to truly enjoy their time with their children. Not only that, but their children will also get to enjoy their time. Time is a gift from God. How we use it matters whether we are 8 or 80. Homeschooling provides the ability to use time more wisely and that is an incredible gift for which I am so very thankful. I know it is a bit late in the day for me to be posting this one, but I figure better late than never. Today is the Feast of St. Anthony - one of my favorite saints. He is the patron saint of lost souls and lost items, and honestly, he generally helps me find something (often one of the kids' toys that they have lost and desperately need to find!) on an almost daily basis. I don't know what I would do without him. It's nice to know that the saints are in heaven and are always ready to help us, even with the mundane things like finding lost toys! Claire Nobel is a member of the “sandwich” generation. She is in her forties, responsible for caring for her aging parents as well as being the parent of an adult daughter who is not speaking to her. Having taken care of every one else for most of her life, she is planning on (finally!) claiming her life for herself. She is engaged to be married, planning on pursuing her love of photography at a workshop on Cape Cod, and looking forward to moving across the country. When Claire’s daughter Amy shows up and gives birth unexpectedly, a huge wrench is thrown her plans. 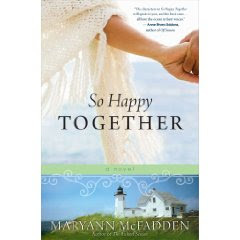 Thus begins “So Happy Together” by MaryAnn McFadden, a story many women will be able to appreciate and relate to. McFadden not only deftly tells the story of Claire, but also that of her parents and her daughter. Three generations dealing with life at three different stages are each forced to discover new truths about themselves and about each other. “So Happy Together” is about the ties that truly bind and what it means to be a family. It is also about finding love at unexpected times and places. As the description on the back of the book states, “when you’re a mother, or a daughter, you’re never truly free.” Nor, perhaps, would we want to be. The only caveat I would offer for Catholic readers is that Claire's mother Fanny was raised Catholic but now dabbles in Buddhism. Nevertheless, “So Happy Together” is a very pleasant read. I highly recommend it. Words DO Hurt talking about how important the words that we use with our children are. It never ceases to amaze me how the Holy Spirit can speak to us if only we are open to it. We might open a book and find just the passage we need to answer a question that has been bothering us or a friend might call at the monent when life is falling apart and offer the encouragement that is desperately needed. Somehow, God provides what we need when we need it. As a former spiritual director of mine was fond of saying, “There are no coincidences, only God-incidences.” I had an experience like that just this past week. Wednesday morning, I had the strong feeling that I should go to morning Mass. It was 7:50 a.m. My local Church has an 8:15 mass. My children were occupied and my husband was home so I could go; I hadn’t eaten yet so I knew I could go to communion. There was nothing standing in my way, so I decided to heed the call and go. The first reading was from the book of Tobit (Tobit 3:1-11). It told the story of two people begging for death. The first was Tobit who had been blind for four years. He felt like a burden to his family. As Tobit states, “be pleased to take my life from me; so that I may be delivered from earth and become earth again. Better death than life for me, for I have endured groundless insult and am in deepest sorrow.” The second suffering soul was Sarah. She had been married seven times, yet each time her husband died before the marriage could be consummated. For this, she was taunted by her father’s serving girls. She decided that life was no longer worth living. She made the decision to hang herself, but then she thought better of it, knowing that such an action would only bring shame to her father. She decides, “I should do better not to hang myself, but to beg the Lord to let me die and not live to hear any more insults.” Ultimately, the Lord would take pity on both Tobit, who would eventually be healed of his blindness, and Sarah, who would be married to Tobias and live happily with him for many years. The homily that morning focused on trusting in God even in our darkest hour, trusting that God has a plan that will come to fruition in God’s time, not ours. This was a message I desperately needed to hear. Yes, it is something that I am well aware of, but sometimes one does need a reminder. Both Tobit and Sarah had good reasons for feeling discouraged. As someone who has suffered from depression for over twenty years, discouragement often seems like my constant companion and darkness often prevails. I can be fine for a while, and then I will wake up one morning and feel like I was hit by a two by four during the night. It is like a dark curtain has fallen and life seems meaningless. Anyone who thinks that people choose to be depressed has never truly experienced depression. I have been in that place where I have begged for death more times than I care to admit. As a teenager, I was suicidal. Only my fear of hell kept me alive. As an adult, I have more perspective. I know the curtain will eventually lift, although sometimes it can take months. I have learned how to function in spite of my feelings so that even those closest to me are unaware of what I am going through. Only my faith carries me through until the light eventually comes again. Yes, I know what it is to suffer in the darkness and throw myself on God’s mercy. This message of trusting in God was one that I needed to be reminded of. I need to believe that God has a plan. The Holy Spirit reached out and spoke to me through the darkness. For that, I am incredibly grateful. Here are two pro-life items I would like to share with you. The first comes courtesy of the Massachusetts Citizens for Life. There was an article on responding to people who make blatantly anti-life statements in one's presence. It gave the following tip on how to respond: "Babies aren't responsible for the crimes or the mistakes of their parents." That is such an important thing to remember. The second item is this video by Jamie Thietten of her song "My Chance"